Unlike Cameron McNeish in Scotland’s 100 Best Walks, I already knew how picturesque the villages of East Fife are: but like him, I was not prepared a few years ago for just how enjoyable the Fife Coastal Path was to walk, especially the two-day section between St Andrews and Elie. My last post took you to St Andrews. So while we are in the area, why not have a look round more of the East Neuk? The day after St Andrews we decided to go for a short walk along the Fife coast, starting in Crail. It was a dull day, but watching the cormorants and seagulls from the coast path entertained us. There were few other people out this day, save a small passing group who looked and sounded like students. How different life must have been when the two isolated fishing bothies on the shoreline were inhabited. The low rocky shoreline is backed all the way by crumbly earth cliffs. There was a great deal of driftwood washed up on and caught in the shore rocks and we collected some. Loads of plastic bottles had also been washed up, but had been collected together by civic-minded persons and placed in fish boxes, prior to a later removal. However the highlight of this stretch of coast between Crail and Anstruther was the Caiplie Caves, a strange sandstone formation that includes holes going right through the rock and out the other side. As we approached Cellardyke and Anstruther, I couldn't get James Yorkston and the Athletes' tune Shipwreckers out my head. This band are a member of The Fence Collective, a loose band of musicians who have coalesced in Anstruther around the organising figure of Kenny Anderson, stage name King Creosote. James Yorkston and the Athletes is one of my favourites, and Shipwreckers is redolent of this coast. Hopefully we would have a warm crackling fire later with the driftwood we had collected! The settlements on this coast, clinging like limpets round their tiny harbours, have been fisher touns - and no doubt, havens for wreckers and smugglers too - for centuries. Cellardyke - back when it was thriving - was called Stinky Haven. Today is is neither smelly nor busy! Cellardyke - as I have been firmly informed by a local - is a separate town to Anstruther and not, as one might assume from the map, a suburb. The clue to this is its separate harbour. As we walked through the streets of Cellardyke into Anstruther, the day's forecast sunshine suddenly burst through thinning clouds, and our last hour was bathed in the beautiful sunshine of a winter's afternoon. After buying chips in the famous Anstruther Fish Bar - its fame has caused a loss of business in chip shops as far away as St Andrews - we walked along the harbour wall and took the bus back to Crail, the lighthouse winking on the Isle of May, Shipwreckers still on my mind. It is only after you drive away from this area, towards your home in one of the grey unprepossesing towns in the Central Belt, that a nagging question bubbles to the surface. 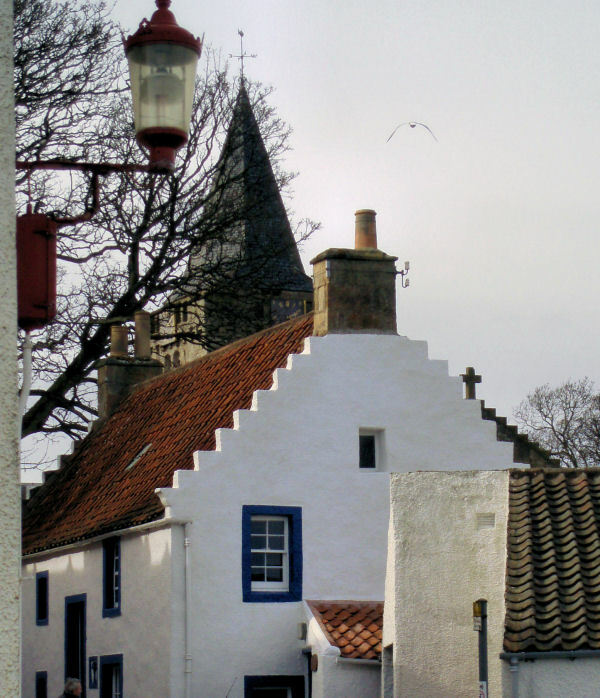 Why aren't more Scottish towns as attractive as those in the East Neuk? At this time of year - the first day of spring for some - thoughts turn to love. For me, ever since a mid-February family wedding in St Andrews, thoughts turn to that grey town on its low cliff between two fine beaches. I have always liked St Andrews: it has strong childhood memories of family holidays, of playing on the East Sands, investigating rock pools, eating chips and ice cream from the harbour cafe, clambering over the castle walls, peering over the vertiginous edge of St Rule's tower, of ducks in the park, rabbits in the campsite, and snuggling up in a sleeping bag after another long summer day spent outdoors. And I am not the only one fond of St Andrews: The university is celebrating its 600th anniversary this month. Prince William and Kate Middleton, who met at the university, are to return to kick off the anniversary celebrations on 25 February. However the St Andrews of February is a town of scarf-wrapped students rather than the summer St Andrews I know of golfers and tourists. And although the East Neuk of Fife, just about the driest and sunniest spot in Scotland, is a great place to go to catch some winter sunshine (as I mentioned earlier), when we woke on this visit the town was gripped in haar, a cold sea-fog that limits visibility and permeates the bones. But this made the town more atmospheric: my memories of St Andrews are all sunny. For the couple of thousand students who graduate each year their memories must be of the haar, of a pinched cold, the weathered stones of the streets and dark coats contrasting with the lively indoor boisterousness of student social life. We took a wander around the town. The first thing I noticed, outside the main university quadrangle on North Street, were stones spelling the letters 'P.H.' on the street. A plaque nearby explained. This was the very spot, in 1528, that the Archbishop of St Andrews burned the popular young priest Patrick Hamilton for promoting the ideas of the Protestant reformers. Although he was not the first heretic burned at the stake in Scotland, his death was the first to cause a ripple of revulsion amongst the Scots. As an advisor to the archbishop said: if he planned to make any more martyrs, it were best he did it indoors, as "the reek of Maister Patrick Hamyltoun infected as many as it blew on." We wandered down North Street, dominated by the old university building, then took a side lane down to the Scores. The buildings here are stone-walled and pantiled and date from the 17th century. At the end of the lane is the Bishop's Castle and another set of letters set into the street - 'G.W.' This was where George Wishart, another Protestant martyr, was burned in 1546. This act was the trigger for the reformation in Scotland, which triumphed when Protestants took over Parliament in 1560. The nearby cathedral, the largest in Scotland and second longest in Britain, was dismantled. Not for nothing have the early reformers been nicknamed the 'Tartan Taliban'. Now this history is in ruins and stumps, largely forgotten, sitting on its foggy headland. We wandered from the Castle on a bracing clifftop walk to the harbour, the tide up, the cathdral ruins dominant on its low hill, then through the medieval portal of The Pends to broad South Street, site of the parish church of St Andrews and the ruined Blackfriars monastery. St Andrews has four 1km-long medieval streets that finger west from the cathedral. Each street, to me, is redolent of each of the four pillars of St Andrews life: South Street for St Andrews' ecclesiastical role, Market Street for the local people and commerce, North Street for the university, and the Scores - which runs from the castle to the West Sands - for golf. No other town in Scotland packs so much history and interest into such a small space. I think it is one of the most romantic towns in Scotland. I like St Andrews a lot and, if you visit, perhaps you will too - but if you go in February, take a scarf! In the old days, forty-plus years ago, there was the Pennine Way. This was Britain's first official long distance path (LDP), and was followed by the likes of the Cornwall Coastal Path and, in 1980, the West Highland Way. Further LDPs followed in England, with its tradition of restricted access to the countryside, but in Scotland there was not the same demand. The longer, harder, and less scenic Southern Upland Way followed the West Highland Way in 1984, and the gentler Speyside Way in 1981. For a long time this trio were the only official long distance footpaths in Scotland, and, like Beyoncé after the split of Destiny's Child, only the West Highland Way enjoyed any popularity. Scots, with their tradition and laws of being able to wander where they please, largely shunned LDPs in favour of the Munros or, for those more disposed to wanderlust, the grand stravaig. Thus the explosion of official and semi-official LDPs in Scotland is a recent phenomenon. Local tourist boards and councils, having seen the business the West Highland Way has brought places like Tyndrum, Kinlochleven and Fort William, are keen to offer something similar themselves. 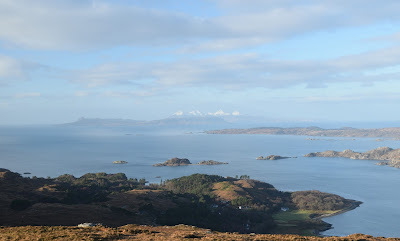 It is hard today to open a map and not see a path going somewhere: from better known routes like the Great Glen Way, Cateran Trail, or Fife Coastal Path; to the lesser known delights of the Cowal Way, West Island Way in Bute, the Rob Roy Trail or the St Cuthbert Way from Melrose to Lindisfarne. Recently, on a drab weekend, for fresh air we visited Peebles and the John Buchan Way. This is a new one for me. It goes from Peebles to Broughton, and can be walked comfortably in a day. Peebles might not be the first place that comes to mind when considering John Buchan, author of The Thirty Nine Steps, Witchwood, and former Governer of Canada, but apparently an association there is. The Way is signposted after the bridge over the Tweed in Peebles, but our attention was immediately caught by activity in the river. Salmon were spawning, right underneath the bridge! These huge fish, up to two feet long, were mesmerising. I was surprised to see no anglers. After watching the salmon for a while, we wandered up through douce estates, the air sharp and fresh, collecting fallen twigs for kindling. Eventually the path leads onto open hillside on Cademuir Hill, home of a couple of hillforts. There is not much to see on the ground, but we detoured off the Way in order to have a look at the second and more impressive of the hillforts. This area is littered with hillforts and prehistoric mounds. Despite its hilliness, it must have been densely populated in the iron age and earlier. Was it as windy, icy and chilly up here then as it was on our walk today? We decided that, rather than continue along the Way to Stobo, we would return to Peebles in a circular walk. This took us along the brawling Manor water, full of dippers, and back to the Tweed. The river here is clear, green, fast-flowing, and full of salmon. Some dead fish lay upturned in the shallows. The highlight was seeing an adult salmon first jump out the water for a look, then tailwalk for a good two seconds. We followed the Tweed under the walls of Neidpath Castle all the way back into the centre of Peebles. This time of year reminds me of the tale of the wise woman and the goat. It's great when you realise it has started to get dark at 5pm rather than 4pm. If I get in to work early, for 8am, then through the wonders of flexitime I can potentially be home before dark! It's still dark setting off in the morning, but each day rolls the darkness back a minute or two further. What a tremendous feeling, especially now I am back on the bike after my bad knee injury back at the end of May. So far I've been cycling in in daylight and home in the dark, even, unwisely, in the mad weather yesterday. Perhaps next week I'll try it the other way round. So where does the goat come in? In the old days, a man at the end of his tether went to the village elder. "Auld Senga," he said, "living in our house is intolerable. There's eight of us in a single end." The wise woman thought about it for a bit. "Take a goat in, and come and see me in a week." "A goat?!" said the man, but went off and did as he was advised. A week later he returned. "Things are worse than ever now! There's eight of us AND a goat!" "Get rid of the goat," said the wise woman, "and come and see me in a week." A week later the man returned, delighted. "It's great at home now. There's so much space now it is just the eight of us." In the same way the darkness falling at 5pm, which was shocking and depressing in November, is now deeply encouraging. The first snowdrops and aconites are out. Whether it snows again or not, spring is round the corner. It's been a while since I've done a poem on here. And what better time than in the afterglow of Burns' Night? In the aftermath of injury I've been getting the bus to work rather than cycling - am only just back on the bike - and have been envious of those I see shooting past early in the morning from my bus. eyelids gummed at bus stop... zoom!